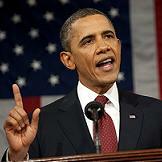 Barack Obama would never be so crass as to use a State of the Union (SOTU) address to announce an “axis of evil”. No. Double O Bama, equipped with his exclusive license to kill (list), is way slicker. As much as he self-confidently pitched a blueprint for a “smart” – not bigger – US government, he kept his foreign policy cards very close to his chest. Few eyebrows were raised on the promise that “by the end of next year our war in Afghanistan will be over”; it won’t be, of course, because Washington will fight to the finish to keep sizeable counterinsurgency boots on the ground – ostensibly to fight, in Obama’s words, those evil “remnants of al-Qaeda”. Obama promised to “help” Libya, Yemen and Somalia, not to mention Mali. He promised to “engage” Russia. He promised to seduce Asia with the Trans-Pacific Partnership – essentially a collection of corporate-friendly free-trade agreements. On the Middle East, he promised to “stand” with those who want freedom; that presumably does not include people from Bahrain. As this was Capitol Hill, he could not help but include the token “preventing Iran from acquiring nuclear weapons”; putting more “pressure” on Syria – whose “regime kills its own people”; and to remain “steadfast” with Israel. North Korea was mentioned. Always knowing what to expect from the horse’s mouth, the foreign ministry in Pyongyang even issued a preemptive attack, stressing that this week’s nuclear test was just a “first response” to US threats; “second and third measures of greater intensity” would be unleashed if Washington continued to be hostile. Obama didn’t even bother to answer criticism of his shadow wars, the Drone Empire and the legal justification for unleashing target practice on US citizens; he mentioned, in passing, that all these operations would be conducted in a “transparent” way. Is that all there is? Oh no, there’s way more. Since 9/11, Washington’s strategy during the George W Bush years – penned by the neo-cons – read like a modified return to land war. But then, after the Iraq quagmire, came a late strategic adjustment, which could be defined as the Petraeus vs Rumsfeld match. The Petraeus “victory” myth, based on his Mesopotamian surge, in fact provided Obama with an opening for leaving Iraq with the illusion of a relative success (a myth comprehensively bought and sold by US corporate media). Then came the Lisbon summit in late 2010, which was set up to turn the North Atlantic Treaty Organization (NATO) into a clone of the UN Security Council in a purely Western format, capable of deploying autonomous military interventions – preemption included – all over the world. This was nothing less than classic Bush-Obama continuum. NATO’s Lisbon summit seemed to have enthroned a Neoliberal Paradise vision of the complex relations between war and the economy; between the military and police operations; and between perennial military hardware upgrading and the political design of preemptive global intervention. Everything, once again, under Obama’s supervision. The war in Afghanistan, for its part, was quite useful to promote NATO as much as NATO was useful to promote the war in Afghanistan – even if NATO did not succeed in becoming the Security Council of the global American Empire, always bent on dominating, or circumventing, the UN. Whatever mission NATO is involved in, command and control is always Washington’s. Only the Pentagon is able to come up with the logistics for a transcontinental, global military operation. Libya 2011 is another prime example. At the start, the French and the Brits were coordinating with the Americans. But then Stuttgart-based AFRICOM took over the command and control of Libyan skies. Everything NATO did afterwards in Libya, the virtual commander in chief was Barack Obama. So Obama owns Libya. As much as Obama owns the Benghazi blowback in Libya. Libya seemed to announce the arrival of NATO as a coalition assembly line on a global scale, capable of organizing wars all across the world by creating the appearance of a political and military consensus, unified by an all-American doctrine of global order pompously titled “NATO’s strategic concept”. Libya may have been “won” by the NATO-AFRICOM combo. But then came the Syria red line, duly imposed by Russia and China. And in Mali – which is blowback from Libya – NATO is not even part of the picture; the French may believe they will secure all the gold and uranium they need in the Sahel – but it’s AFRICOM who stands to benefit in the long term, boosting its military surge against Chinese interests in Africa. What is certain is that throughout this convoluted process Obama has been totally embedded in the logic of what sterling French geopolitical analyst Alain Joxe described as “war neoliberalism”, inherited from the Bush years; one may see it as a champagne definition of the Pentagon’s long, or infinite, war. Obama’s legacy may be in the process of being forged. We might call it Shadow War Forever – coupled with the noxious permanence of Guantanamo. The Pentagon for its part will never abandon its “full spectrum” dream of military hegemony, ideally controlling the future of the world in all those shades of grey zones between Russia and China, the lands of Islam and India, and Africa and Asia. Were lessons learned? Of course not. Double O Bama may have hardly read Nick Turse’s exceptional book Kill Anything that Moves: The Real American War in Vietnam, where he painstakingly documents how the Pentagon produced “a veritable system of suffering”. Similar analysis of the long war on Iraq might only be published by 2040. Obama can afford to be self-confident because the Drone Empire is safe. Most Americans seem to absent-mindedly endorse it – as long as “the terrorists” are alien, not US citizens. And in the minor netherworlds of the global war on terror (GWOT), myriad profiteers gleefully dwell. A former Navy SEAL and a former Green Beret have published a book this week, Benghazi: the Definitive Report, where they actually admit Benghazi was blowback for the shadow war conducted by John Brennan, later rewarded by Obama as the new head of the CIA. The book claims that Petraeus was done in by an internal CIA coup, with senior officers forcing the FBI to launch an investigation of his affair with foxy biographer Paula Broadwell. The motive: these CIA insiders were furious because Petraeus turned the agency into a paramilitary force. Yet that’s exactly what Brennan will keep on doing: Drone Empire, shadow wars, kill list, it’s all there. Petraeus-Brennan is also classic continuum. Then there’s Esquire milking for all it’s worth the story of an anonymous former SEAL Team 6 member, the man who shot Geronimo, aka Osama bin Laden. This is familiar territory, the hagiography of a Great American Killer, whose “three shots changed history”, now abandoned by a couldn’t-care-less government machinery but certainly not by those who can get profitable kicks from his saga way beyond the technically proficient torture-enabling flick – and Oscar contender – Zero Dark Thirty. Meanwhile, this is what’s happening in the real world. China has surpassed the US and is now the biggest trading nation in the world – and counting. This is just the first step towards the establishment of the yuan as a globally traded currency; then will come the yuan as the new global reserve currency, connected to the end of the primacy of the petrodollar… Well, we all know the drill. So that would lead us to reflect on the real political role of the US in the Obama era. Defeated (by Iraqi nationalism) – and in retreat – in Iraq. Defeated (by Pashtun nationalism) – and in retreat – in Afghanistan. Forever cozy with the medieval House of Saud – “secret” drone bases included (something that was widely known as early as July 2011). “Pivoting” to the Indian Ocean and the South China Sea, and pivoting to a whole bunch of African latitudes; all that to try to “contain” China. Thus the question Obama would never dare to ask in a SOTU address (much less in a SOTE – State of the Empire – address). Does the US remain a global imperial power? Or are the Pentagon’s – and the shadow CIA’s – armies nothing more than mercenaries of a global neoliberal system the US still entertains the illusion of controlling? 1. Poll: 45% approve of Obama’s handling of the economy, CBS News, February 12, 2013. 2. The Man Who Killed Osama bin Laden… Is Screwed, Esquire, February 11, 2013. 3. China Eclipses U.S. as Biggest Trading Nation, Bloomberg News, February 10, 2013. 4. Secret drone bases mark latest shift in US attacks on al-Qaeda, The Times, July 26, 2011.